There are not a lot of genuine cruisers on the market for a price around, say, that of a caravan and something to tow it with. Genuine cruiser? Carrying on with the caravan analogy, offering similar standards of accommodation and convenience – as well as being a competent boat. The range of Merry Fishers from French yacht builder Jeanneau fits this bill neatly. Jeanneau build thousands of them each year, and the demand for them is so big that dealers around the world are on quotas. A problem that just about every other builder in the world would love to have. Numbers like that mean genuine production line construction with spot-on quality control. The side benefit is an interior that is almost entirely gelcoat and easy to clean. 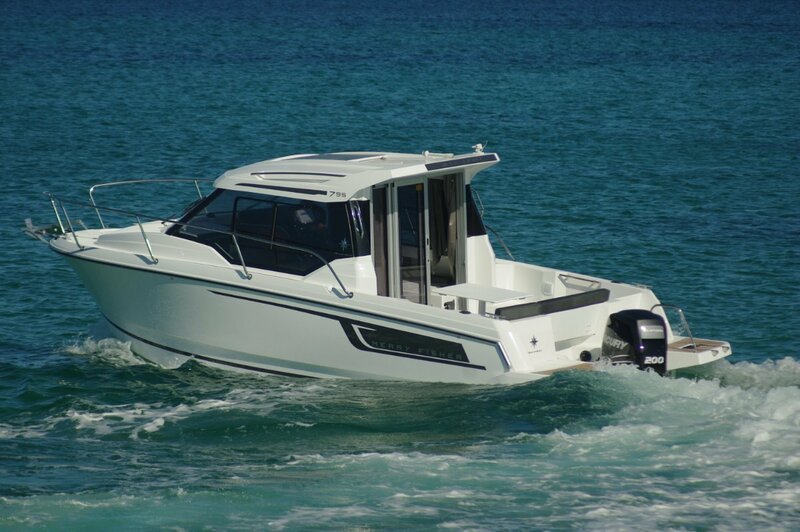 The Merry Fisher 795 under review is in the middle of the size range, and is a lot of boat to fit into a hull length of seven metres, although the 2.8 metre beam helps; increasing beam grows a boat quicker than increasing length. The resulting hull weight of 1,750kg is also substantial for this size of boat, and it has benefits: the ride has the quality of a larger boat. This is a genuine cruising boat with most of the comforts of home built in to the accommodation, standing headroom for tall people being one of them. Largely due to the clever layout there is also a surprising amount of space left over after all the building in. Four people can sit down to dine; five people can sit facing forwards. Serious cooking is possible, which of course is only natural in a French boat. The motor is a 200hp Mercury that gives a maximum speed around 30 knots. Academic really; nobody would buy this boat with great speed in mind. Relaxing rather than stimulating is the vibe. On the other hand, one could be tempted to floor the throttle occasionally just for fun, and there is a lot of fun to be had. The natural cruising speed of this hull is in the low 20s in good weather, which of course is the only kind for cruising. Since getting there is at least as much fun as arriving, ten knots might be an owner’s choice. 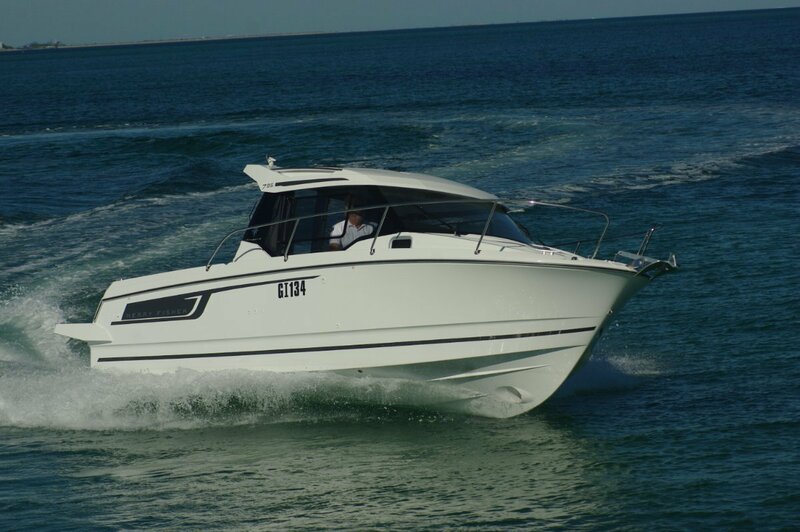 This is a tall boat providing a lot of windage so Jeanneau provides a standard bow thruster to assist with parking and low speed manoeuvring. The main cabin/wheelhouse devotes most of the port side to a removable table and a pair of double seats. The forward seat is reversible for non eating occasions, and the table can be lowered for conversion into a double bed. Wasting no space at all, the fridge lives under the after seat. To starboard is the superb driving bolster seat facing a restrained dash, ancillary items like the radio occupying overhead space. The seat is ahead of the galley that has all the usual galley components, including abundant locker space. Places to put things are a feature of the Merry Fisher: under the cabin and cockpit decks and within every hollow component. My wife fell in love with it. The sense of space is enhanced by the amount of natural light entering. Between the waistline and the roof is almost entirely glass, including the rear bulkhead. Additionally there are skylights. With these, the fore hatch, the rear door and the sliding side glass open this is a well ventilated space with the added benefit of excellent vision for the driver. The cabin will usually take second choice for dining, the cockpit being thoroughly equipped with table and seating – all removable, reversible and so on and even better ventilated. 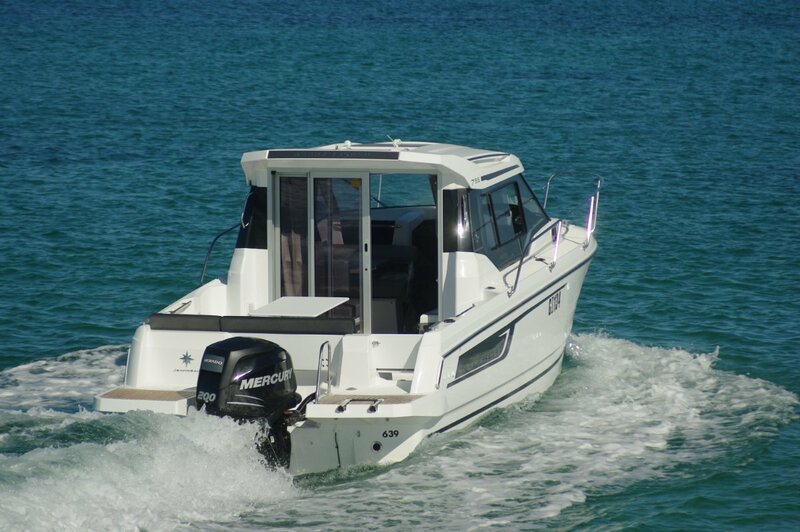 It is also comfortably roomy, and made effectively roomier by the large swim platforms flanking the Mercury. They are big enough to also be fishing platforms. The fore cabin can sleep a pair of adults or, if the optional shower-toilet is installed, one adult or a couple of children. Although the official sleeping complement is three or four, swags on the cockpit deck will accommodate a couple more. The 795 can be trailed with the right vehicle and within some added regulations, but its ideal habitat is probably in rack stowage.